Over the River Trent, up the junction, and to some most splendid moorings on a new-to-me canal #narrowboat #England – The Diesel-Electric Elephant Company. It rained yesterday – but it rained without wind. Breezes were not us. Gales were having a rest (although more are forecast for the weekend). I have coats, I can do rain. It also dawned without the deep-freeze effect of the day before (this is England, if you don’t like the weather, wait fifteen minutes…) and my mooring ropes were pliable! It was though one of those days that never actually achieved daylight as we know it. Still, there was enough light to see by. We – the Cardinal and I – moved again. This is the first of the two locks, our last on the Staffordshire & Worcestershire canal (for a while – we’ll be back…), and a mere 4′ 3″ descent. 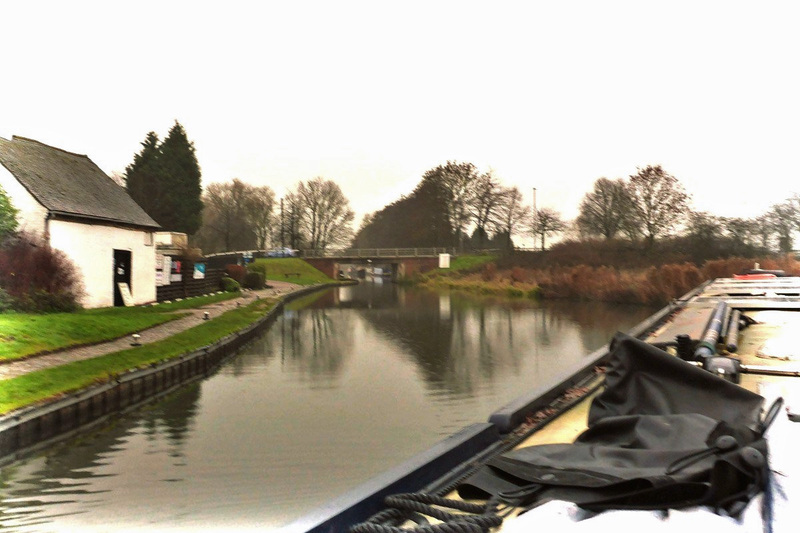 Two more locks, four more miles – sufficient for us to bid a farewell to the Staffordshire & Worcestershire Canal and move instead onto a new-to-me canal, the Trent & Mersey. This stretch that I am on was completed in 1771, but the whole canal proper was officially opened in 1777. Josiah Wedgwood was among the chief protagonists, apparently, and the canal is held in place by a 12″ layer of clay over gravel, and the banks are held in place by bundles of faggots. The lead photograph shows the Cardinal turning north out of the junction, we popped out of the bridge-hole below (after a couple of warning blasts on the horn). Great Haywood Junction where the Staffordshire & Worcestershire canal meets the Trent & Mersey canal. The junction is at a place known as Great Haywood. Getting to the vicinity of the junction was a matter of a couple of miles and one civilised lock with only a 4′ 3″ drop in level, making a total descent over the past two days of 47′ 3″. This was accomplished without extra oxygen or sherpas. Getting actually to the junction itself was, courtesy of the local hire company and its total disregard for other boaters, a matter of squeezing past the bows of millions of hire-boats stored for the winter. Hire boats, stacked up like sardines stored for the winter, bows all poking out into the public canal without so much as an oh do excuse us. Great Haywood Junction. Tut-tut and tsk-tsk. Other, more respectable, just better hire companies manage to avoid half-blocking the canal, so why can’t this lot manage it? It’s just plain rude! Getting away from the junction was a matter of a couple of miles and one interestingly leaky lock presenting a rise of 7′ 9″. We’re going up in the world again. The top gates really ought to see a urologist, there’s a world of difference between a dribble and a ruddy waterfall. I managed to keep the Cardinal’s bow, and his well deck and bow doors back from the flow as the lock filled. En route during the morning we passed through a stretch of canal so wide that it would have brought tears of emotion to my eyes during our recent passage through the The Gobsmacking Narrows. This place is Tixall Wide – and wide it is, more like a lake than a canal. Apparently it is filthy with kingfishers. Nestled in the woodlands on view opposite is the National Trust property Shugborough Hall, a stately pad originally owned by the Bishops of Lichfield (such pious, church-mouse chaps they were) until the dissolution of the monasteries (and looking at Shugborough one might begin to see the reasons). It was then flogged by the Exchequer to a local lawyer, William Anson. Any familiar Establishment pattern emerging for you here yet? He, over the next three centuries, became the Earls of Lichfield (same old same old) and only fell foul in nineteen-sixty, after the government (a democracy run on benevolent lines for the people, apparently) invented Death Duties and promptly grabbed back the whole estate, lock, stock and barrel. Robber ruddy barons, all, from that day to this. Anyway, I digress (again). Tixall Wide. Tixall Wide on the Staffordshire & Worcestershire Canal. It is wide. Apparently navigable from one side to the other, for some unfathomable reason. Loch Ness’s monster’s favourite spot for summer holidays, too. There’s something slightly disconcerting about suddenly being offered so much space for manoeuvre, so much room for independent decision. Where’s the middle? Am I far enough over? Am I far enough out? Also, considering that this is a stretch of canal it is most, most, most unusual in being navigable from bank to bank, from one side to the other. Ordinarily with canals the offside is a place of shallows and sea-monsters. If you can’t turn a boat around in Tixall Wide then you really ought not to be in the business of turning boats around. I didn’t want to turn around. Ruddy typical – best chance ever for a full-throttle spin and I don’t need it. I wanted to cruise on through. It would be a very nice place to moor up for a while, but it didn’t get me far enough on my itinerary, and certainly not far enough for a day when I was boating with cold rain running down my neck… If I was going to bother then I was going to bother! The end ought to be sufficient to justify the rivulets of water making my long-johns soggy. Tixall Wide on the Staffordshire & Worcestershire Canal eventually narrows, although rather prettily it must be said. We trolled on, and Tixall Wide gradually, gradually became Tixall Normal-Width. It was pretty though, and there were swans and everything, no expared had been spenced. We got to go over the mighty River Trent. It may be the third-longest river in the United Kingdom of Great Britain & Northern Ireland, but here it’s a tiddler at no more than twenty or thirty feet across. Rotten photograph, but in my defence while the aqueduct may be wide the canal within it is narrow, and both before and after were lines of moored boats. Aqueduct over the River Trent, the Staffordshire & Worcestershire Canal. After this morning in the rain I was royally rewarded (not with Shugborough Hall & Estate but) with chancing upon some most splendid moorings – room for two short boats here or one long one, simple, easy, neat, pre-formed mooring rings, quick and easy to tie up to, no overhanging trees – and, wonder of wonders, an interwebnets signal from somewhere (probably Shugborough Hall’s servants’ quarters). I thought for a second, a few quick blips of reverse thrust to slow us, a smidgen of forward to edge us in to the side and we were done for the day. Just had to put the chimney back on, remove that which ought not to be left outside to the inside, slip out a couple of fenders, tickle the stove back into life (after his enforced morning of neglect as we cruised) and job done, Bob’s yer aunty. I have let yonder The Fuel Boat, Halsall, know of my change of whereabouts, and if the breezes are to pick up for another day or three then I have the perfect excuse to stay here a while. Mind you, it’s not perfect. As I moored up there were tweed-and-waxed-jacket clad Hooray Henry types bravely, selflessly, noisily blasting the bejabers out of the savage, wild, thronging masses of killer pheasant in a small copse to the left of frame in the photo above. How silly they looked, how very unecessary they all are. How few chins they had between them. Photo taken at the extreme of my luvverly rinky-dinky compact pocket camera’s zoom – and my preference is for idiots with guns to be farther away even that that. In fact, if they were on another planet (preferably an airless one) it would have suited me better. I loathe guns. Oh Tarquin! You are a silly cove! You shot a seagull! Tar-quin shot a sea-gull! Tar-quin shot a sea-gull! Tar-quin shot a sea-gull! (other dances and jigs are available, does not imply endorsement or approval, E&OE, terms and conditions apply). Giles, may one borrow your dawg? Mine seems to have stopped working after I accidentally shot it. Ruddy thing farted and I panicked. Rupert – I can’t get the cartidges into the end of my gun-thingy. They won’t fit. I’ve looked down the barrel and there’s no blockages until you get to the trigger, and I can see that moving when I pull the little watchermacallit, the make-go big bang-bang hand-lever. Henry, that’s because they don’t go in the barrel, you have to break the gun first and then insert them into the… NO! When I said “break the gun” I didn’t mean… oh, and it was Mummy’s best Purdey too! So, anyway, splendid move, splendid new moorings for a while, and I have largely dried out and warmed up again! I’ll end this log entry with a spot of a brain-teaser. Why on earth might this bridge be called “Swivel Bridge”, when it is plainly nothing of the sort? Right. Chin-chin for the mo (unless you’re a “sportsman” murderer of pheasant). Stay a lert, folks (we have enough loofs). I would like to add. ‘…and despise’, to your ‘loathing’ of firearms. Living this close to the American reverence for them, (Canada) is occasionally, and getting more so by the day, not a restful place to be. Wholly agreed! It is horrible to see England’s Policemen now permanently toting machine guns (airports, ports, London in general and any and all major tourist “attraction”). England has caught the gun disease. The local sort are constantly talking about how they don’t waste the animal. They EAT it. As though that is the magic that makes their sport of killing things OK. They HONESTLY and STUPIDLY equate themselves with hunter / gatherer tribesmen. Most of the American Sportsmen are equally as dim, but generally with less money. The ones with money go to exotic places so they can kill endangered animals to hang on walls. Great White Hunters. Also known as Grotesque Wastes of Humans, Or they go to local farms with exotic animals and hunt them there. It’s NEARLY sporting! And no one knows whether the head on your wall came from Africa or Florida. I have thoughts, none of them flattering to any of the group. I think 150 years from now people will look back at us and be horrified most by the fact that we eat animals. (including myself) I appreciate the good sense of a being a vegetarian or vegan I just don’t seem to have the effort in me to pull it off. Had a ferret around t’internet and found: “The 1790 L&LC Act had a clause specifically prohibiting swing bridges, except where agreed with local people and land owners, the clause being inserted because of the problems cause by existing swing bridges.” There is one other reference to your specific Swivel bridge and found “The final bridge leading to the water meadows, is called the swivel bridge, although now it is a simple brick arch.” The implication being it was, like other swing bridges, converted at some point sometimes because there was too much traffic, or because it was unattended. Someone obviously forgot to change the name at the same time. All that expanse of water made me feel giddy, much happier when we’ve moved back to normal – hark at me the land lubber! Jolly good piece though. That probably accounts for it, it was almost certainly a swing bridge or some such in days of fore and yore, and converted to an “ordinary” bridge at the behest of some land-owner fed up with it being left open. 🙂 I had enough of swing bridges on the Llangollen canal, they can be a real pain when single-handed! I do notice that the bridges around here are a lot – a LOT – lower than those farther up north, I’ve had to duck down much more than is dignified on quite a few occasions lately.